On a rainy spring day in Seattle, young software tycoon Micah Taylor receives a cryptic, twenty-five-year-old letter from a great uncle he never knew. It claims a home awaits him on the Oregon coast that will turn his world inside out. Suspecting a prank, Micah arrives at Cannon Beach to discover a stunning brand new nine-thousand square foot house. And after meeting Sarah Sabin at a nearby ice cream shop, he has two reasons to visit the beach every weekend.When bizarre things start happening in the rooms of the home, Micah suspects they have some connection to his enigmatic new friend, Rick, the town mechanic. But Rick will only say the house is spiritual. This unnerves Micah because his faith slipped away like the tide years ago, and he wants to keep it that way. But as he slowly discovers, the home isn't just spiritual, it's a physical manifestation of his soul, which God uses to heal Micah's darkest wounds and lead him into an astonishing new destiny. 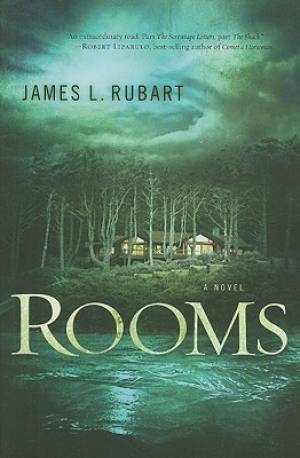 Rooms A Novel by James L Rubart was published by B & H PUBLISHING GROUP in June 2010 and is our 26325th best seller. The ISBN for Rooms A Novel is 9780805448887. Be the first to review Rooms A Novel! Got a question? No problem! Just click here to ask us about Rooms A Novel.